A survey of 43 major web operations in Latin America has found that their biggest training needs are in the area of creating multimedia packages and writing for the Internet. More than half the sites do not rewrite print stories for their web editions. The researchers, Guillermo Franco, Julio César Guzmán and Mauricio Romero, are all editors with El Tiempo and eltiempo.com in Colombia. The survey, published on the Poynter Institute's website last year, was done by web and telephone and includes the leaders of these online operations as opposed to a random sample. 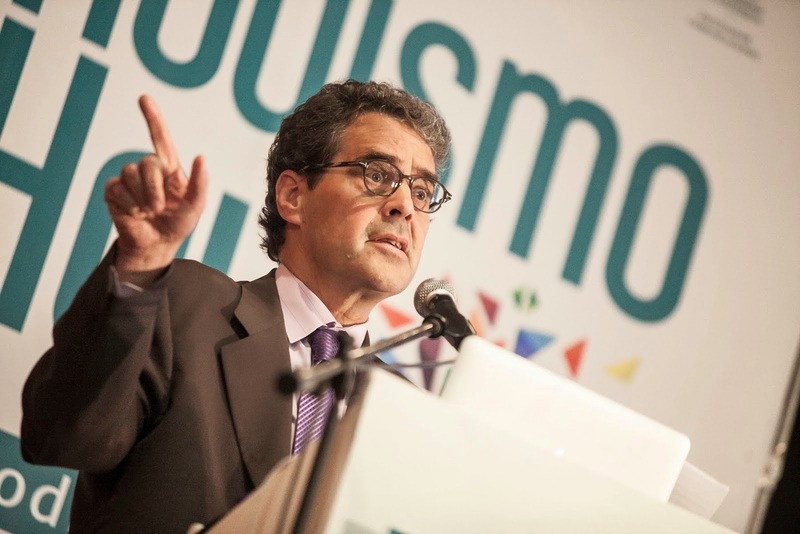 "The Internet continues to be a marginal operation in most of newspapers in Latin America. Evidence for this is the small number of journalists who work in Web departments (42 percent of the newpapers operate with three or fewer journalists, whereas 66 percent employ eight or fewer people)." Forty-five percent of the journalists working on these sites have degrees in digital journalism. "In 71 percent of the Web sites, the average age of their journalists is between 20 and 30 years old (down from 87 percent in the previous survey [in 2004])." These news operations generally focus on editing and rewrite. Only 7 percent say that reporting is their main focus. This gibes with the heavy dependence on the print edition for their content. At the same time, two-thirds of these web operations report that they have autonomy in terms of writing headlines, choosing story angles and establishing story hierarchy. - Only half the organizations provide the email addresses of the reporters with their stories. - 68 percent consider user content generation a revolution for journalism. However, 30 percent think users should be controlled so that they do not cause more harm than good. The authors cited limitations in their research. An examination of websites included in the survey found major discrepancies between what some said their practices were and what was actually observed. "For example, when asked about Flash-generated content, 52 percent say that they do it systematically and frequently. By surfing their Web sites, it is revealed that this is not so true." My own recent experience of looking for a place to rent in Mexico's second-largest city, Guadlajara, found virtually no online classifieds on the daily newspaper sites. As of yet, there does not appear to be a strong online competitor for classifieds there. The tough cases for bosses are the people who are on the margin. Entire books have been written on the subject, but what follows is a few tips based on my own experience and from helping others. -- The charming longtime employee who has evaded all attempts to get him to adapt to new technology. For a small organization to compete, every person has to contribute. You can't afford to have someone who is marginally productive. -- The above-average performer who treats other people badly and won't contribute to the team effort. In other words, this is a self-centered person who meets individual performance goals, and no more. -- The average performer who makes derogatory comments about others behind their back, rolls her eyes when asked to do anything she considers outside her own narrow definition of her job and generally oozes negativity. The negativity is infecting others. As a boss, you have to take action as soon as you see that this person's performance is affecting the performance of others and the organization. You can't wait for this person to provide you with the perfect excuse to take action. The biggest mistake we all make is waiting too long. Set a time for a private meeting. Make it clear that this is important and the person must attend. Ask a lot of questions during the meeting. What does the person think his job is? What problems is that person having in the job? What does the person want more of and less of in his job? Find out what's going on. Probe for information. Once you have some understanding of that person's perspective, you can take the opportunity to set expectations and draw boundaries. If the person's idea of job responsibilities is not in synch with yours, this is the time to make that clear. -- "Starting today, you need to change the tone you use when you speak to your fellow employees. Dismissive comments like "whatever" are not acceptable. One-word answers to your supervisor's questions are not acceptable. That has to change, starting right now." -- "You have to become conversant with this new software package we use in accounting. Starting this week, you will begin a program of training so that you can fill out the online forms required to process orders, invoices and customer requests. You will be performing at X level by such-and-such a date. But the effort begins now." -- "Starting today, your goal will be for everyone to say that you are a pleasure to work with. Making derogatory comments about the company or others is not acceptable and must stop immediately. If you are unhappy here, you need to keep that to yourself. You might consider what kind of work or company will make you happy. What do you think that might be?" Ultimately, there have to be consequences for failure to perform. It could be loss of a bonus, no pay raise, a cut in pay, or ultimately termination. Every organization has its own rules about how to handle this, but a clear statement of expectations and the consequences for not meeting expectations will go a long way toward getting someone's attention. My experience is that some people will change and some won't. Some people want you to set boundaries, and others will bridle. Getting into action will make this clear. Finally, if you are so unhappy with an employee that you are considering termination, it seems only fair to tell that person the truth: unless you change, you're in danger of losing your job. Give them a chance to change. There is much more that could be said on this topic. What are your experiences? How do you handle these situations?